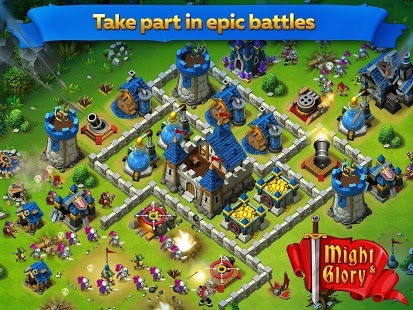 Log into Might and Glory and get diamonds and a unique decor for your base! Install it on your premises and become the true ruler of the Kingdom! Embrace the simplicity: all battles are simple, and yet each battle is unique. Wow! Imagine the possibilities: upgrade your buildings and armies, set up an ideal defense and come up with an effective attack! Smite other players: crush your enemies or take revenge on your oppressors! Epic heroes: train your own Warlock and Warrior who will help you conquer the world with powerful spells and deadly swords. They are the ones who will lead your army into bloody battle and be the key to victory over the most vicious invaders. Guild wars: create alliances of players united under common flags. Make cooperative plans to overwhelm your enemies, take part in tournaments, build guild defensive buildings together and participate in guild raids. Earn rewards for your guild’s joint operations, help others and receive support from players from all over the world! Eye candy: enjoy bright and colorful high-quality HD graphics! We use the device identifier only to save the progress of the game, and not for anything else. Really good game guys good work, but I only have one problem when I go to battle and I put all my troops out and win I still lose all my troops can you please make it so we only loes the ones what die in battle thank. Hello, Dave! We think it would be too easy to save all troops. You can send only some of your soldiers in attacks if you’re certain of victory. So you need to manage your forces skillfully to make sure that every attack results in seized resources. It makes the game more interesting. Best regards,My.com Team.